If you deal with any kind of event-based information on your websites, you would probably really like an easy way of letting users add it to their calendar. Unlike link sharing—where there are some great drop-in solutions like AddToAny and AddThis—calendar integration unfortunately remains a bit rough around the edges. Varying standards with varying degrees of adoption; consideration for desktop and web-based calendar clients; and the complicating factor of timezones make it all a bit harder than it really should be. AddToCal is a jQuery UI Widget that I put together to help me solve the problem and do things like you see in the screen clip on the right. It's freely shared and available on github. Using it on a web page is as simple as including the js links, binding it to the DOM elements or classes on your page that contain "events", and provide an implementation of the getEventDetails method that knows how to extract the event details from your particular DOM structure. The example also demonstrates how to use AddToCal in conjunction with the hCalendar microformat for event notation (try it out here). 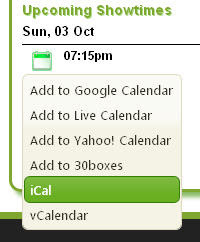 What about iCal and vCalendar formats? These are complicated a little because we need a URL to the respective iCal and vCalendar format resources .. so we need to be able to serve them before AddToCal can link to them. Thankfully, this can be relatively trivial once you get a handle on the file formats. Here's an example of how to implement with Ruby on Rails.